I am super tired after a long (but good) day, so I'll try keep this brief. This week was mostly about applying acrylics and practising full manicures. I think for the next few weeks these updates will be less regular; at the moment it's more about perfectly our technique than learning theory. It's time to buckle down and get good at this! I did more walking to nail school this week. I'm trying to make it a regular thing, but sometimes getting a ride is so much easier. 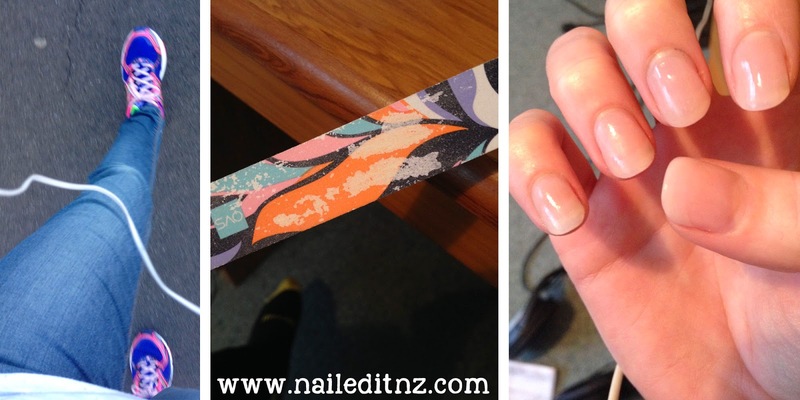 I also wore out my normal nail file when shaping my acrylics that I got last week - I couldn't believe it, it took it right down to the plastic! It was kind of annoying, as the file was only a few weeks old, but oh well. It shows that the files we use in course are good quality! 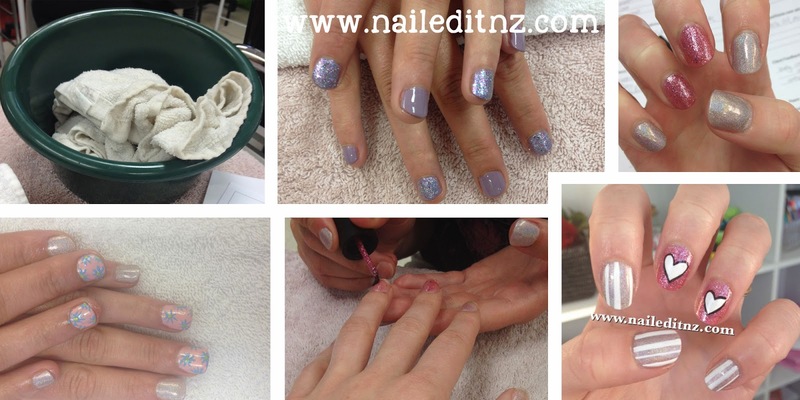 Above are a few more snapshots from nails I've done/had done this week. Can't wait until we re-stock the nail art supplies, the old ones are looking a bit miserable! Those towels are in the picture for a reason - to remind me to use tongs when getting hot towels out! I grabbed one with my hand and it burned. I did the whole "oh, ow, oh, ow" thing, then threw it at the table, and consequently at my poor friend's hand... I think I'll be hearing about how I'm a danger to my clients for a long time yet. Oops! It was pretty funny though. We've now all done a full set of acrylics, but on separate days. 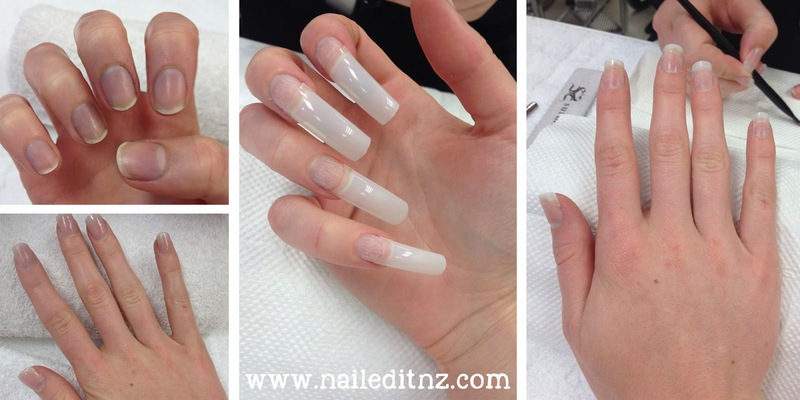 The first time we pretty much went straight into it, but the second time we had learnt a bit about the form and shape of the nails. Naturally take two was better! It's going to take a bit more practice to get the nails right, but I'm sure we'll get there in the end. I asked my teachers if I could name both them and the school I'm learning at on my blog, and they said I could. So, I'm doing the National Certificate in Beauty Services (Nail Technology) Level 3, at Ucol. 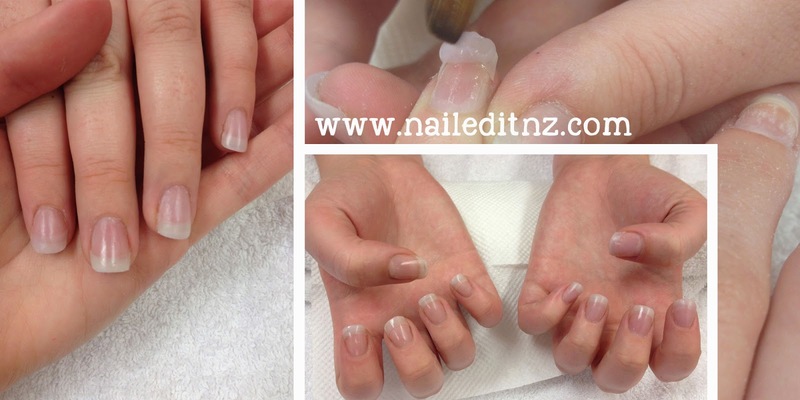 It's a nationally recognised qualification and while the nail industry in NZ isn't regulated yet, it will be one day and this course is great at making sure you're up to high standards. My teachers are both called Andrea, which is a bit confusing! One is Andrea Billing (she's the one I've nick-named 'Smiley' on here) and the other is Andrea Jackson. They're both very knowledgeable, friendly and approachable ☺. That's about it! I don't have any little facts I can think to add right now, I'll store them up and maybe do a post about it after the course. It's practise practise practise from here on out! I'll update when I feel I have enough information to, but I will probably do mini-updates on Facebook and Instagram, so make sure you're following me on there ☺. On a bit of a side note, I had the pleasure of meeting one of my followers yesterday! Kaitlyn's been following me online for ages and when she told me she was in town I was super keen to meet her. I always remember the people who regularly comment on things, and she's one of them. She's such a lovely girl and I had a great couple of hours hanging out in town with her. If she's a good representation of the kind of people who follow my blog I am honoured to have such a cool group of fans! Today I went to a polish party - more to come later in my very first vlog! Keep an eye out for it on my YouTube channel here ;). And that's me for now. I've had such a full-on last few days and am looking forward to getting some sleep!